I told you all about Father's Day. I should now share what happened the day after: my brother's graduation ceremony. Participants and their families were advised to meet at University of Toronto's Convocation Hall around 830am. I wanted to help my parents do this, but they were stubborn. They couldn't drive themselves, and they didn't want me driving their precious minivan. I was looking into Zipcar: for 78.00 I could have rented a car for the day, with air conditioning. You know, it's just as well I didn't do that. Even the SUVs they rent out don't hold enough people. So Abie and I stayed home while Nathan lined up with other participants, while my folks sat in the cool auditorium, and while Ari and his new wife Vivian watched in the tent erected for such visitors. There was a luncheon afterwards. I didn't hear bad things, so I assume it was a well catered event. The family met at the Mandarin for 630pm. Mom chose the one at Dufferin and Finch Av W. After everyone came, and we made our first trip through the buffet, Mom wondered where the crab legs were hiding, as there is some kind of a "crab celebration" event. For the record, they only have crab on Friday and Saturday Nights: make a note of it. They did have amazing roast beef. They had acceptable steak. Fresh hotel style coffee (a mild roast, think of Nabob or Mother Parker's). I had a fried shrimp, it made Mandarin proud. The other fried stuff looked good too. The men all talked a lot, telling stories. The women present were often cut off! My new sister-in-law is a cardiologist, and I wanted to ask some questions. Well, there was nothing I could do. Ari (middle brother) answered, Dad answered, Nathan answered. The girls weren't silent, but had to compete for air time. After dinner, we went to Finch Station, and all but our parents went to Union Station. Actually, Nathan's friend Jennifer went eastbound to meet her sister. Those remaining sat around the bus terminal at Union talking a lot. So by now, it's nearly midnight. Ari and Vivian bid us farewell. We could have joined them back in the bus, but after a big dinner, if I'm not in a food coma, I like to walk a lot. So we walked to Bloor and Yonge. It rained on us! We got wet, but not fully soaked. Home by 130am. Our family doesn't meet this way often, so it was a good thing we did. We don't spend time with aunts and uncles, cousins and cousins. Both my parents, and all three of us brothers were together. I'm not sure this is related, but maybe it is. It's easy to believe myths like 'when I was young, we were so poor we had to walk up hill both ways.' So while Abie and I were walking north on Yonge Street, I realized my childhood wasn't free of restaurant stops as we passed 401 Yonge St.
We went to Lindy's, an old fashioned kind of steak house. I think we went there at least twice each year. 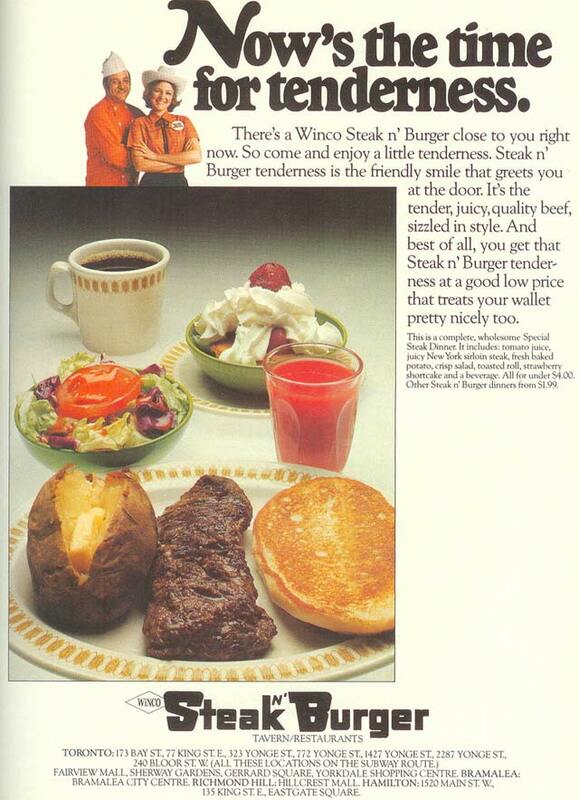 They used to tenderize their steaks. While it makes them easier to eat, I remember the parents complaining near the end that it was over tenderized. Shortly after we stopped going there, they closed their doors. I think it is now the home of 401 Convenience, at 401 Yonge St. Don't let the name fool you: it is a place to buy cards for most of the different genre games, such as Pokemon, Magic the Gathering or Yu-Gi-Oh. I don't remember us going to McDonalds very much. Maybe five times over a 20 year period as children and teens. But this wasn't because we never went out. I am thinking it might have been avoided because it wasn't as good a value as television made it out to be. We did go to Harvey's, having their breakfast sometimes. Dad still remembers how they used to actually fry eggs and bacon, rather than make some incarnation of an egg mc muffin. There was a Red Barn at the end of our street, with a Canadian Tire, and later a No Frills. The tiny hamburgers were actually 15c. As a family and as individuals, we really liked their fried chicken, since it wasn't as salty as Kentucky Fried. But Red Barn didn't have kentucky fried gravy, so we went to KFC when that was what we wanted. KFC also had the pureed cole slaw. Mom felt it was a ripoff that the small container was so very small, and that the medium container was was such a big jump in price. Nevertheless, we got a KFC deal once or twice each summer. There were some things we never ate at the restaurant. We always had take-out Chinese Food. When we lived on Beaconsfield Av, this happened perhaps once every month or two. Even less frequent was when Mom or Dad would drive to Spadina, and pick up a pound of genuine corned beef and a fresh rye. Even back in those days, a corned beef sandwich was costly, and not arranged in a family friendly way. They would load two small slices of rye bread with 6oz of sliced meat. This isn't something you'd entrust to a 6-year-old. So Mom got a real rye bread, and didn't heap it with a mountain in the centre. Oh, still something fell out occasionally, but we were faster than our pet daschund, Heidi. Do you remember Ponderosa? I do. How about Steak and Burger? Both places offered steak for families, with low family pricing. We used to go out as a family to these places. I don't remember what we talked about during these events. I wish I could summon the memory, but I just get the visuals, the tastes, the smells.